Something about bread baking makes me feel very calm. It takes all day, kneading, resting, kneading, resting, which is almost zen kind of experience. Not that I am religious or anything, so I wouldn’t know the real zen relaxation, but I feel good when baking bread. I just saw a recipe on Food Network, and thought it would be a good weekend pastime. Dissolve sugar and yeast in water, let it bubble up for about 8 minutes. Mix it with honey, 1 whole egg, egg yolks, olive oil. 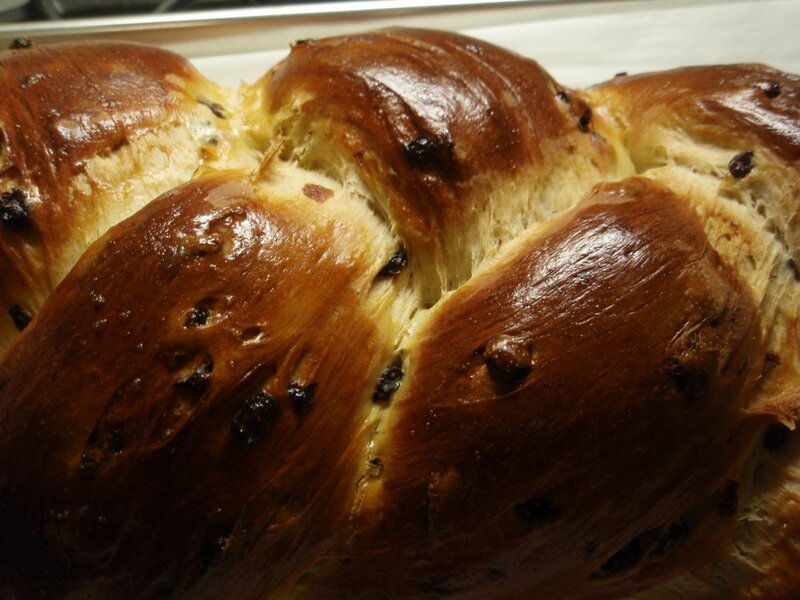 Make a well on flour and salt mixture, pour in the wet ingredients, and currants. Once it’s mixed, knead it for about 10 minutes. Once it’s smooth, put it in a greased bowl, and let it rise until the size doubles. (Fortunately I have a bread rising mechanism on my oven, so it was easy). When the size doubles, punch it down and knead it for just a minute, then put it back and let it rise again until the size doubles. Once it’s done, you cut the dough into three equal pieces (some people do 6, but I took the easy way). 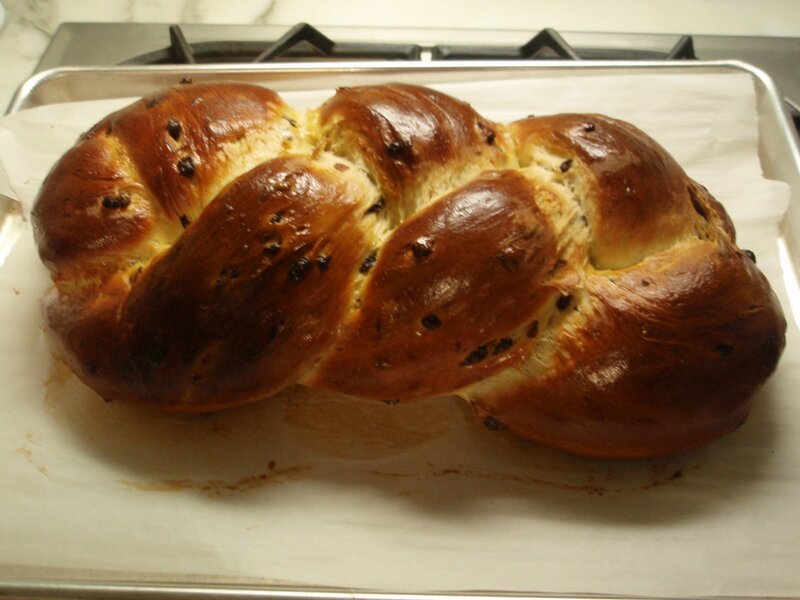 Braid the dough nicely, as if you are braiding a girl’s hair. Let is rise AGAIN until the size doubles. Brush it with egg, bake it for about 30 minutes on 375 oven or until it sounds hollow. I didn’t sprinkle it with poppy seeds, since I don’t have such a drug in my household. hehe. I should have taken pictures of each step, but of course, when I realized this would be a perfect one, it was already done. Doesn’t this look GORGEOUS? I should work for Amy’s Bread. Too bad, I don’t eat too much bread, and I have NO IDEA about good bread vs. bad bread. But I brought it to work, and many “bread connoisseurs” said it was fabulous. So I guess it was a success in both appearance and taste. This entry was posted on February 20, 2008 at 6:11 pm and is filed under *Yamahomo, Baking, Bread. You can follow any responses to this entry through the RSS 2.0 feed. You can leave a response, or trackback from your own site. i miss yamahomo bakery!!! looks so good. That looks super yummy! How can you not eat so much bread…you are both lucky and damned! 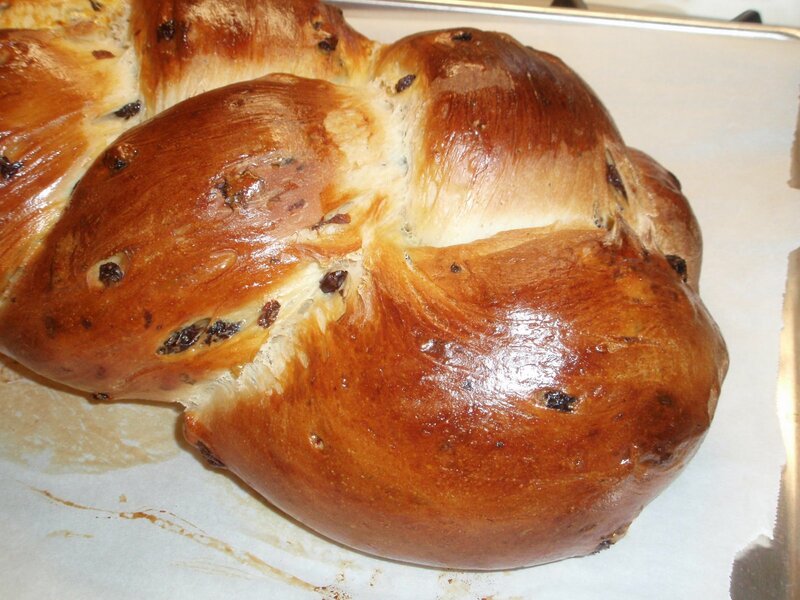 Why don’t they make more challah with raisins?